He dies slowly, who avoids a passion and its swirl of emotions, precisely those that return the shine to the eyes and restore the broken hearts. Muere lentamente quien evita una pasión y su remolino de emociones, justamente éstas que regresan el brillo a los ojos y restauran los corazones destrozados. Perfect for Halloween!!! Another GREAT creation by Isis Secretspy. When I saw this beautiful creation of Isis Secretspy from irrISIStible, I could not help remembering the banana dancings of the famous Frenchwoman Josephine Baker in 1920’s. A beauty very different from the beauty of today, but no less impressive. 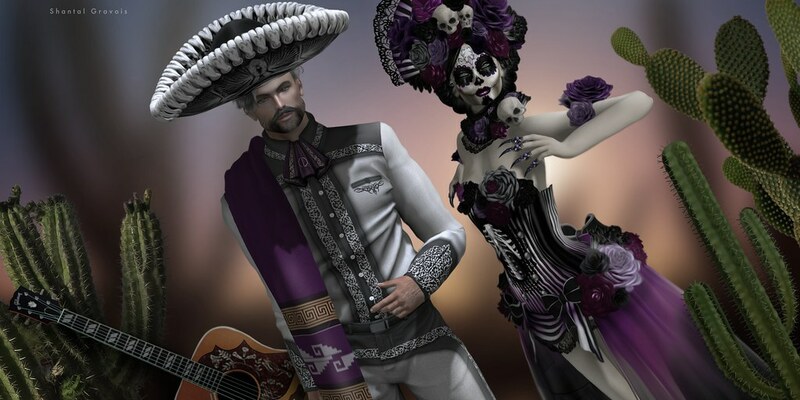 I wanted to recreate these magical moments in Second life, with a beautiful dance and stylizing this beautiful outfit with Algezares makeup. Find this beautiful outfit in SWANK EVENT. A beautiful alternative that you can find in SWANK event (June Round), created by the talented Isis Secretspy for IrrISIStible. Inspired by Koi fish, this complete outfit makes you feel part of the aquarium immediately. Perfect for a magical story at the bottom of the sea. I complemented it with golden makeup of Alge’s Makeup, by Algezares Magic, that every time has more interesting proposals to give a different touch.